Chili cheese fries are hugely popular in California. So what do you do when you want to open up a taco restaurant on the West Coast? If you're Ed Hackbarth, then instead of chili you use taco-seasoned meat. Hackbart opened Casa De Taco in the 1960s, but later it became known as simply Del Taco. Del Taco was always one of my favorite restaurants during my stint in Ventura California. If you wanted comfort food, if you had the late night munchies, then Del Taco was one of the fast-food chains that cured this unique California ailment. 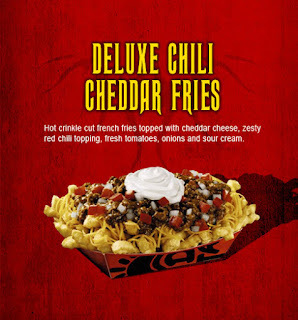 Del Taco's Deluxe Chili Cheese Fries eventually became one of their most famous cult-legend foods on the scene. (They also offer a more basic version with just taco meat and cheese.) In fact Del Taco supposedly has a secret menu left over from the days of Hackbarth that include everything from the Green Bean Machine, to a Bun Taco. Remind me next time I'm in L.A., to research this covert secret menu.